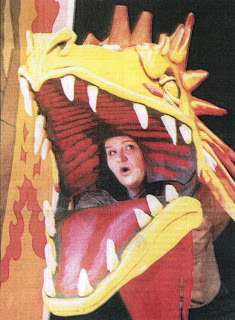 Seattle Opera Blog: Brava and best wishes, Margaret Gawrysiak! Brava and best wishes, Margaret Gawrysiak! This afternoon’s performance of A Midsummer Night’s Dream will be mezzo soprano Margaret Gawrysiak’s last appearance at Seattle Opera...for a little while, at least! Margaret sings Hippolita in this weekend’s Midsummers (Rose Beattie takes over the role next weekend) and then dashes off to begin rehearsals of L’enfant et les sortilèges/Gianni Schicchi at Opera Company of Philadelphia, where she’s making her debut in the same roles she sang for Seattle Opera’s YAP last season: Mère/Tasse/Pâtre/Libellule and Zita. 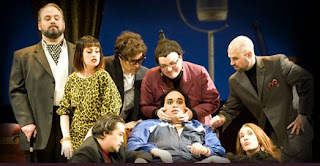 (Above, Margaret as Zita, surrounded by her oddball relatives, menaces the Schicchi of Michael McGee.) You can find more information about Opera Philly’s production HERE. 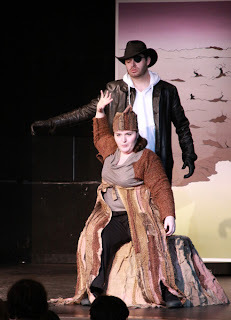 ...and of course Erda the earth goddess (right, with Thomas Forde as Wotan). I’ll never forget Maggie’s performance as Enfant’s teacup, singing its demented pidgin-French Chinese gobbledygook and dancing the foxtrot with Noah Baetge’s teacup—-a definitive performance, and I can only hope they’ll be able to reach such heights of delicious lunacy in Philadelphia! 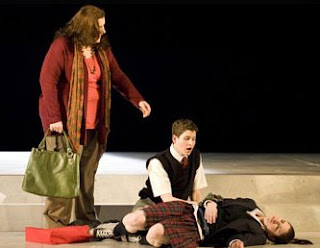 Above, Margaret Gawrysiak as Maman, in L'enfant, greets David Korn as the Child and Elizabeth Pojanowski as the wounded Squirrel. Mr. Dean - I heartily concur with your assessment of Margaret Gawrysiak. She has been a joy to watch on the stage. I wish her the best in Philadelphia and beyond. I completely agree: it is always a thrill to see a Young Artist take the next step in their career. Best of luck Margaret - I hope we see you back in Seattle before too long. It has been wonderful to watch Maggie develop her talents through the Young Artists Program. We wish her much success! THis is one of the best plays ever! We watched it once during our Philadelphia dating getaway!